Business Loop Interstate 44 at Waynesville-St. Roberts is unique because not only does it intersect, but it briefly multi-plexes Business Spur Interstate 44. The Waynesville-St. Roberts loop runs along Interstate 44 between exits 161 and 156. BUSN Loop I-44 passes through the following towns in Pulaski County. 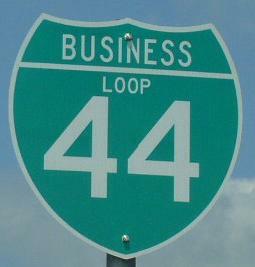 BUSN Loop I-44 is multi-plexed in Pulaski County. BUSN Spur I-44, at St. Roberts. Missouri State Route 17, near Waynesville. Missouri Secondary State Route H, at Waynesville. BUSN Loop I-44 intersects the following highways in Pulaski County. 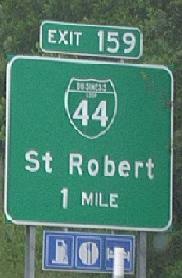 Interstate 44, at St. Roberts. Missouri State Route 17, at Waynesville. Missouri Secondary State Route H, near Waynesville. A BGS on EB I-44.